EDD Bookings offers two ways to view and manage your bookings; a list view and a calendar view. In the List view, you can view all your bookings together. There is also the option to filter your bookings list based on service or month of the year, or both. The list is also searchable via client name and surname, and email address. Edit/View Booking - this will open the booking modal for that booking, allowing you to review the details or edit them as needed. All options can be edited at all times. Delete Permanently - this will delete the booking permanently from your database. Once this is done, the booking can never be recovered. The Calendar view will present an interactive calendar that displays all bookings that are in your database. The bookings within the calendar can be clicked on. When doing so, the booking modal will appear showing all the booking details. You can also edit the booking details through this modal and update them on the fly. The calendar provides three views of its own - day, week and month - depending on what you need at any time. You may filter the calendar by service to show one service at a time, and it is also searchable via client name and surname, and email address. The colours for each booking correspond to the booking's status, as set in the general settings. Both the List and Calendar views provide Screen Options. These can be found at the top of your page, just beneath the admin bar. From here, you can check and uncheck specific booking statuses. Unchecking a booking status will hide it from both the List and Calendar views. 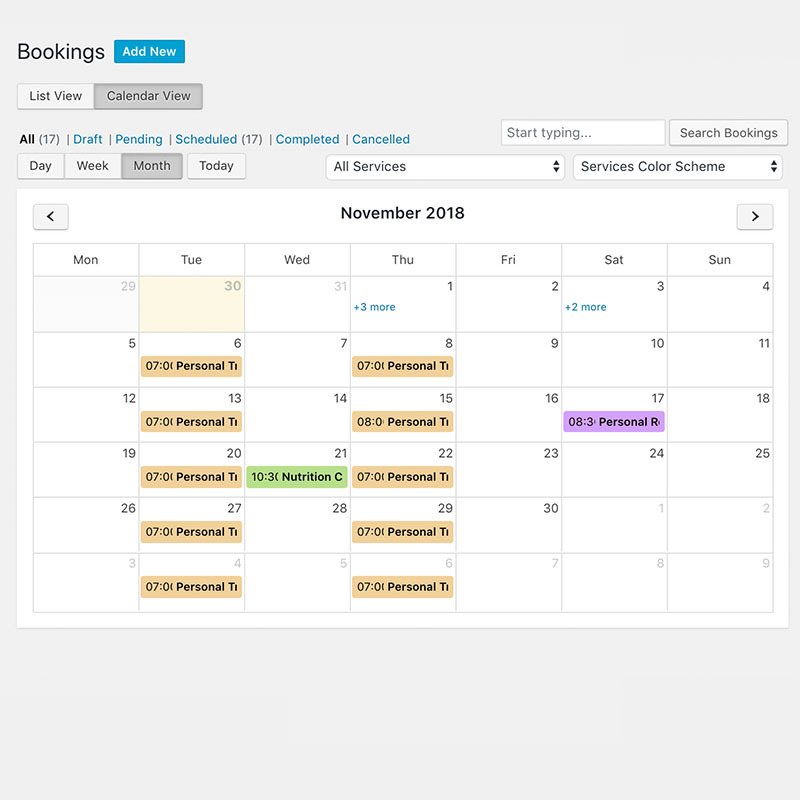 This is great for those situations where you will only want to have an overview of your scheduled bookings or those times you may want to have an overview of only cancelled bookings.